A self-driving car passes the Carnegie Natural History Museum. From Lo and Behold, 2016. — Werner Herzog speaking before a Pittsburgh audience, at the Carnegie Lecture Hall, in 1980. In 1895, the Lumière brothers made film history. With a primitive movie camera placed in front of the gate of their light factory, the brothers created the first documentary, an “actuality” of French working class society. Masses of workers shuffle out, two youths flirt momentarily, and a curious dog and several children playfully dart past the static frame. A mere 45 seconds long, the grainy black-and-white film still shapes our understanding of modern life and the industrial workplace as it once was. More than a century later, German filmmaker Werner Herzog set out to document a different sort of factory. His film Lo and Behold, Reveries of the Connected World, released in January of 2016 at Sundance, traces the rise of the Internet and the connected world, taking us into laboratories and workspaces from Silicon Valley to Pittsburgh, Pennsylvania. At CMU’s state-of-the-art Robotics Institute based in Lawrenceville, Herzog fixes his camera not on human workers, but on a robot, named CHIMP, that can perform simple mechanical tasks like opening a door and navigating a room. Like the Lumière film, Herzog’s Lo and Behold has been widely acclaimed as a time capsule, a marker of evolutionary leaps in science, technology, and society. But, more than the Internet, artificial intelligence, or robotics, Herzog’s new film Lo and Behold reveals a preoccupation with the city of Pittsburgh, in subject and style. Signaling the city's industrial legacy and its turbulent transition toward a knowledge-based economy, Herzog delivers his characteristically dry but impassioned voice-over: “The steel mills are long gone, a new industry has taken its place.” Herzog celebrates this “new" Pittsburgh in a state of technological change. He places the viewer inside driver-less cars, and the streetscapes of historic Oakland are rendered anew through graphic overlays and a slick, computer-operated camera. He offers amusing yet eerie “operational images” of Pittsburgh-engineered robots learning to play soccer. Leading scientists, many of them CMU faculty, speculate on our computer-dependent future - a vision of Pittsburgh that assimilates the industrial past into the tech sector, as if to be forgotten. View outside CMU’s Robotics Facility in Lawrenceville. From Lo and Behold, 2016. Herzog’s connection to the Steel City stretches back decades. Before earning accolades as a pioneer of the French New Wave-influenced “New German Cinema,” in the mid-1960s Herzog spent a year of study in Pittsburgh through a Fulbright Scholarship sponsored by Duquesne University. Of all the places in the world, what attracted him to Pittsburgh? "I wanted to come to the United States, but I didn't want to go to New York or Los Angeles,” he told Paul Cronin. “I chose Pittsburgh, a place populated by real working people, by welders.” Lured by the reputation of industrial activity, of modern and urban life, he thought he would finally find his tribe; instead, he dropped out of Duquesne after three days. A Fox Chapel family literally picked the destitute young Herzog off the streets, and he found employment working in a factory for about a year. During this time, he worked on NASA documentaries at WQED station in Oakland, until, lacking a valid visa, he fled to Mexico to avoid being deported. By 1980, Herzog achieved international fame with the 1979 release of Nosferatu the Vampyr, an English-language remake of the German Expressionist cult film. That year, he returned to Pittsburgh, presenting a few screenings from his catalog as organized by the Carnegie Museum of Art’s once lustrous Film Section program. Herzog was one of many German-speaking filmmakers (including Kurt Kren, Peter Kubelka, Wilhelm and Birgit Hein, among others) passing through Pittsburgh at the time. In the early 1980s, Pittsburgh was considered a thriving “third coast” for independent film production. Its technology, steel industry and robust media and art scene, plus the long shadow of George Romero, the king of zombie horror, made it an irresistible destination. Between the screenings and his lecture, Herzog asked to see some local films. Though most weren’t to his taste, one documentary in particular struck him: Tony Buba’s 1979 portrait of a troubled, theatrical Braddock street hustler Sweet Sal. In the opening scene, Sal Caru calls himself a savior and a killer, and threatens to murder anyone who crosses him. As the movie credits rolled, Herzog demanded to see every film Buba ever made. In Buba, Herzog found a searching sympathy for people who seemed slightly crazy at first glance: Buba, similarly, resisted taking sides or moralizing in his films. He made portraits of people you weren’t sure you could trust, with a healthy sense of humor. The truth wasn’t contained in a message, but something one had to work out after the film ended. Buba’s thoughtful, ironic tone, and his sympathy for the strange, the marginal, and the eccentric, which he cultivated in the Braddock Chronicles, re-appears in Herzog’s knowing voice-over throughout Lo and Behold. Even as a consummate Luddite, Herzog repeatedly hints that technological optimism around robotics, automation, Internet, computer science, if left unchecked, risks becoming automatic and mechanical. Machine-like. One detects a sense of exhaustion, of boredom, in Herzog’s faux-naïve voice. Sometimes, as when he asks “can the Internet dream?” he slips into impatient skepticism. Here and there, Herzog’s cleverly injects doubt into the movie’s endless chorus of techno-utopians. For every corporate technocrat peddling the next world-disrupting invention, Herzog contrasts their science-fiction fantasies with the perspectives of doomsayers, of hard-nosed realists, of outcasts pushed to the margins of respectability. Take the world’s most infamous hacker, Kevin Mitnick, who reveals how vulnerable we are to technical insecurities, in the face of the all-too-human con artist; or a band of New England physicists who seal themselves off the grid, in a pastoral refuge, because their bodies have mysteriously become over-sensitive to radio waves and cellular signals. Elon Musk, CEO of SpaceX, bears resemblance to J. Roy. From Lo and Behold, 2016. Elon Musk, CEO of Tesla and SpaceX, is a classic Herzogian character and someone who bears a lot of similarity to Tony Buba’s stable of misguided anti-heroes. One of the Braddock portraits which made Buba famous was J. Roy–New and Used Furniture, 1974, about a businessman with 12 failed businesses. 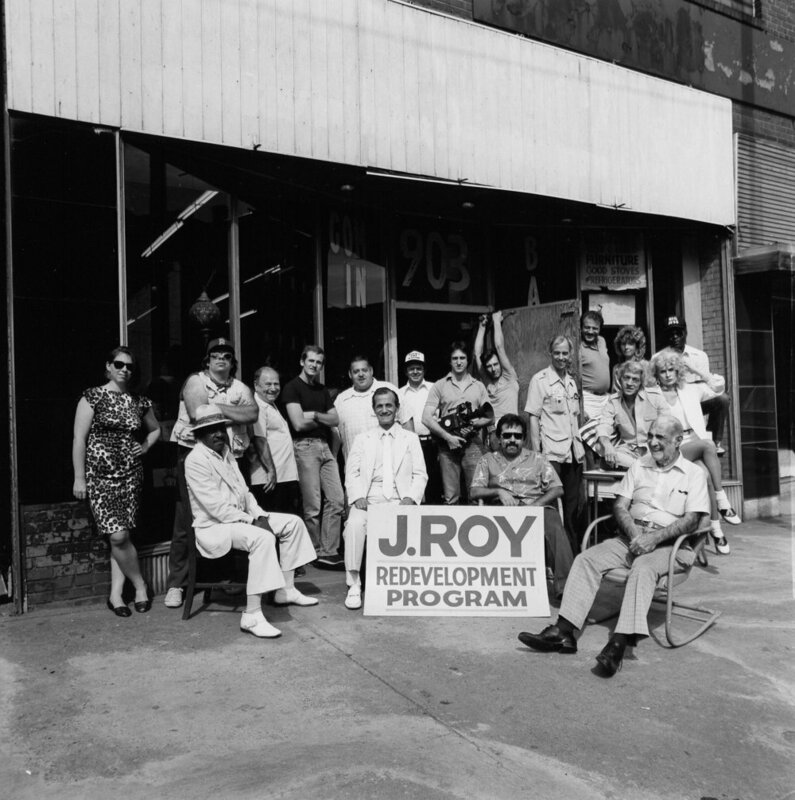 J. Roy had a seemingly bottom-less faith that no matter what happened to Braddock, the spirit of capitalism will help his business, and the milltown people, stay afloat. The film portrait shows him spreading the gospel to his own sales staff, as he awaits a crowd of shoppers to materialize for the opening of his renovated store (they never do). As if in homage to Buba, Herzog shows the folly of a new generation of dreamers, in particular, Musk’s ambition to colonize Mars. (Herzog half jokingly, half seriously, tells the CEO he will be first in line to take a trip to Mars). Though Herzog permits his dreamer to wax evocatively about the Internet-connected Martian future to come, the film simultaneously punctures the self-seriousness of these ambitions through sharp, contrapuntal editing. To wit: the film cross-cuts to Dr. Lucianne Walkowicz, astronomer of the Adler Planetarium, who observes that the one thing she’s noticed about our time on earth is our aptitude for destroying the habitability of our planet, more than a feasible plan to colonize Mars. Then, Herzog immediately cuts to a shot of Musk emotionally or physically disturbed, upset, as if he were bristling to the comments we just heard. Musk transforms, momentarily, into businessman J. Roy. Pittsburgh’s importance to Lo and Behold is amply demonstrated in the industrial architecture; the selection of interview subjects from CMU’s finest faculty; but, perhaps most of all, in the subtle stylistic touches which reveal the deep impression of our home-grown film auteur, Tony Buba. What both filmmakers share is a humanistic awareness that should make viewers wonder: what gets we left behind in our culture’s endless drive for the new—an unlivable planet (Herzog)? Manufacturing in Pittsburgh (Buba)? Significantly, the title of the film, Lo and Behold, refers both to the birth of the Internet, and a breakdown of technological certainty and power: rather than register the full word “log” communicated across two computers, a server crashed after two letters, giving us the word, “L-O”-- a word rich in meaning, which we can only appreciate after the fact. Like Buba, Herzog admires the dreamers unable to realize their dreams, and suggests we take seriously our present-day culture as the real space of those un-actualized dreams. View of Tony Buba and J. Roy. From J. Roy–New and Used Furniture, 1974. A review of the recent show at the Silvery Eye Center of Photography. Past Present Future: Western Pennsylvania’s People and Places, the inaugural show at the new Silver Eye Center of Photography, in Garfield/Friendship, reveals the Steel City in a state of unending transformation. Melancholic, pensive, and at times spooky, the show presents 40 photographers across 100 years of work. The images are organized in a series of thematic units--Athletics, landscape, industry, life in the postindustrial rust belt, and more. Pieces are grouped in rows, forming a cluster of pictures. Historical and contemporary artists are mixed together, with the only common thread being artwork that is in conversation with the past – past styles, past ways of life and aging neighborhoods in stages of transition. Towering figures like Eugene Smith, Charles “Teenie” Harris, and Duane Michaels depict a noir-ish city drenched in shadow and light. These figures are juxtaposed with Western Pennsylvania artists, such as Dan Wetmore, Ross Mantle, Sue Abramson, or experimental filmmaker Ross Nugent. Surprising stories, visual echoes and historical resonances come up in these juxtapositions. Nugent’s Steel Mill Rolling – the only moving-image work in the show – with its enigmatic mill, from Farrell, PA, is brought to life with a hypnotic electronic soundtrack, and dialogues with themes of aesthetic modernism, nostalgia and industrial decline in the rest of the show. Some of the most intriguing images are removed from the milltown mythos. Esther Bubley’s 1950s images of the Children’s Hospital, offer eerie monochrome and striking close-up of doctors at work. Pamela Bryan’s ghost signs from small town PA overwhelm the picture frame with a surprising monumental scale. Aaronel deRoy Gruber’s panoramic, depopulated cityscapes mine the past for an aura of what-has-been. A sense of spatial identity is strongly felt in all these artworks, which is a function of the thoughtful curating. The city itself is a simple theme but is taken in many directions. In the end, the exhibition reveals that no single image can sum up or define Pittsburgh’s essence. Instead what matters is the sense of beautiful mystery that these images create. We are left with a lingering desire to see more, to produce or seek out more images knowing full well that nothing will lessen the city’s grip on our imagination.